Santorini has been a top destination on my bucket list and I was extremely excited to plan this trip to celebrate our upcoming 5 year wedding anniversary. B and I wanted to, not only, recap our trip, but also share some tips. We will have a rating for each spot on this Greece trip summarizing scenery, food, culture/people, and value. Be on the lookout for our recap of Mykonos and Athens coming soon! We arrived in Santorini with the Ferry from Mykonos, it’s about a 2.5 hour boat ride. You can ferry from many islands & Athens (time vary from 2.5 - 4.5 hours depending on where you are coming from), but you can also fly into the island. 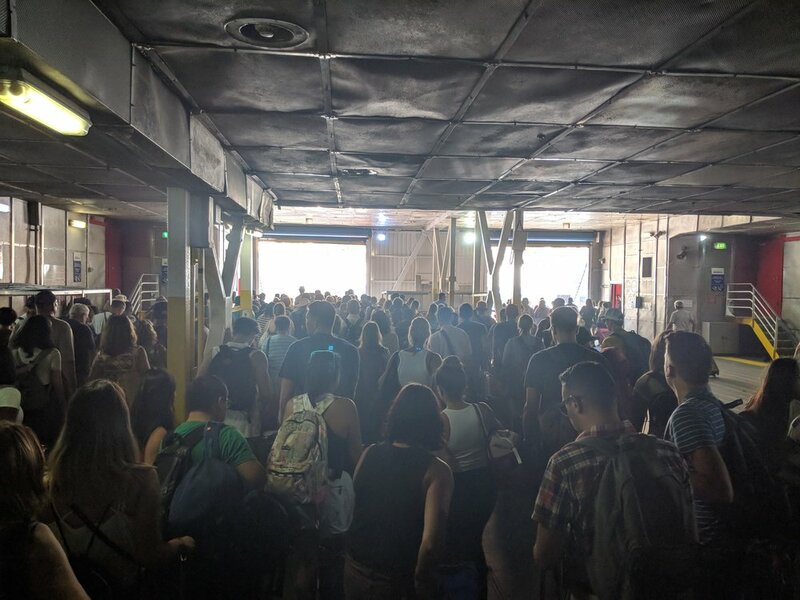 The ferry experience was far from ideal and disorganized. We booked tickets in advance from this site, but you still have to go to the ticket office (located downtown) to print your tickets. Apparently, no site allows you to print your tickets in advance - you must pick them up from the travel agency or office you book with. Upon arrival to the new port in Mykonos, there are no signs or instructions for what ramp you wait by for your boat. We showed our tickets to one of the Coast Guard officers that was managing the crowds, and he let us know to wait behind the rope at ramp 3. There was no line and no order, so when the boat arrived (10 min PAST it’s intended departure time), it quickly unloaded people and the crowd dashed to the boat area. You leave your luggage on the first floor in no particular order and then walk upstairs to find your seats. The entire process was far from ideal but our seats were comfortable. TIP: Arrange travel with your hotel to pick you up from the port - it makes it easier to escape the madness at the port. Also, pick up your tickets in advance since the ticket office may not be near the port. 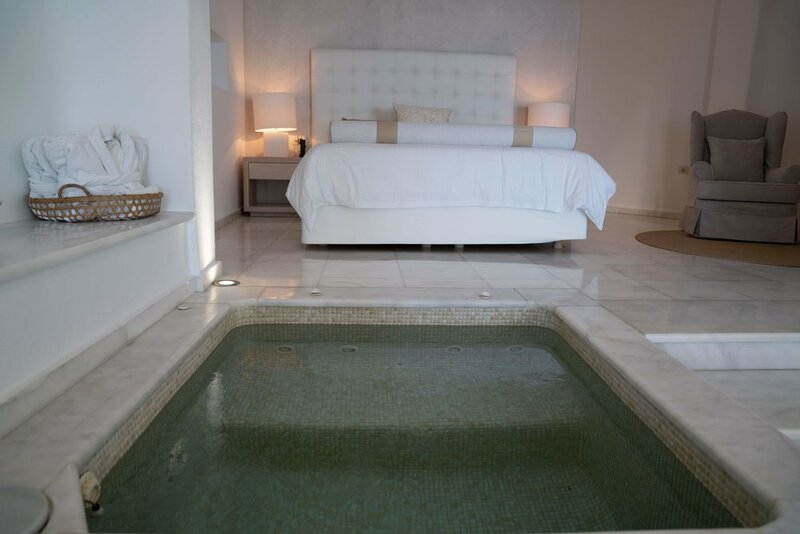 In Santorini, we stayed at the Gold Suites in Imergolivi (a small luxury hotel). Imergolivi is located in between the famous Oia (known for its sunsets & blue dome churches) and Fira (lively downtown area filled with restaurants, bars, and shopping). We were upgraded to the grand suite and it did not disappoint. We had a spacious living room, dining room, an indoor jacuzzi and outdoor pool. We had a wonderful view of the caldera and Oia from our balcony, where we ate breakfast almost every morning. You can order whatever you want for breakfast from the menu and it gets delivered straight to your patio. We enjoyed a few sunsets from our balcony and the view was stunning! TIP: Stay in Imerovigli if you want views of the sunset and caldera without the crowds of people that are often in Oia. Most cruisers and day visitors will visit and crowded parts of Oia; this did not happen in Imerovigli and I thought the views were just as stunning. When it comes to views, Santorini will not let you down. There is a walkway that connects Thira to Imergolivi (about 20-30 min walk), and from Imerovigli to Oia (about a 2 hour hike). We loved walking around with the beautiful views. However, the hike to Oia is a bit of a challenging one. You will certainly break a sweat, so pack accordingly. TIP: Some parts of the hike to Oia are best suited for hiking shoes (we only had sneakers and some areas were a bit slippery rocks/sand). There were two activities that we did on the island that are a must-do and one of my favorite parts of the trip! The first is a catamaran boat tour around the island. We did a 5 hour day cruise with Santorini Yachting Club that started in the port of Vlychada. You stop at the Volcanic Red beach for a swim (it was too windy that day for us to stop for a swim here) and continue on to the White beach (you can only access this beach from a boat). Since we couldn’t stop at either beach, we made a stop to swim in the gorgeous Aegean blue waters while lunch was cooking on the grill. We had grilled chicken, grilled pork, traditional greek salad, dolmas (rice stuffed grape leaves) and unlimited wine/beers on the entire boat trip. Finally, we continued on to the Volcano and Hot Springs. It was a beautiful tour and we only had 12 people on our boat (maximum is 16 people for this tour). Our group was so much fun and we had a blast! This is a great option to see the southern parts of the island and swim within the Aegean sea - most of the beaches in Santorini are rock beaches, so without water shoes, it is not comfortable to swim from the shore. TIP: Do NOT wear any light colored cover up or swimsuit if you plan on swimming in the hot springs! The sulfur will stain your clothing. On our last day, we went to Santo Wines, a famous winery with beautiful views of the caldera. You can taste a variety of wines from the island with the tasting options + food pairings. We had the 16 wine tasting to share. Each glass was supposed to be 60 ml, however, they were very generous with the pour (80 to 100 ml). That equates to well over a traditional bottle of wine, and included everything from sparkling wines to dessert wines. The sparking rose was one of our favorites! If you wish to see more, there are plenty of wine tours that allow you to visit multiple wineries on the island. Laokasti (Oia): Traditional Greek food with, hands down, the best Greek salad we had in Greece. We also tried the veal orzo & Moussaka - both which were good. We saw some fireworks during our dinner which was also a fun surprise. This restaurant was great and was reasonably priced for the island. Mezzo (Imerovigli): A cute little restaurant with a stunning view. We had greek salad and chicken skewers but the menu had much more than that. TIP: It is very common to be charged for bread at many restaurants (ranges between 2-3 euro per person) and is often just given to you, even if you did not order it. There is no denying that the views from Santorini are absolutely breathtaking. There were some amazing restaurants and we had the best greek salad on our trip in Santorini. Lots of great food options, fresh seafood, and most restaurants come with a killer view of the sunset. Santorini is extremely pricey (hotel, food, tours… you are definitely paying a premium to stay on this island). I guess that is what happens when it seems to have exploded with tourists over the last few years. It was very busy and crowded (we went at the start of high season at it was still crowded and pricey). While the views of this island were beautiful everything felt a bit overpriced. I loved the beautiful views of the island and the fresh seafood + greek food that is responsible for my rating. Unfortunately, the island has become a bit of a tourist trap with lots of tourists flocking the island and the prices reflecting the high demand. I am a bit late to visit and I just know I would have absolutely fell in love with this island a few years ago before all the instagram fame. I still would recommend this island as a part of your visit to Greece just be prepared to pay a premium. Overall, Santorini is a very scenic island. From just about every square inch, you have a view of the waters. We even found a few spots that were so high and unobstructed, that you are able to view the water on both sides of the island. However, Santorini lost points in scenery due to it’s repetitive landscape. There is something to see in almost every direction, but the views are nearly identical (White structures, rocky shores, the water, and other Greek isles in the distance). The food was consistently “good” on the island. Nothing will knock your socks off, but just about everything we had was “good”. Much like the scenes, the menus are somewhat repetitive. Luckily, most of the menus had plenty to choose from. Santorini takes a hit in this department. We met some really cool people on the island. Unfortunately, most of those people were from New York, California, and North Carolina. Again, I don’t think anyone has an expectation of “authenticity” when visiting Santorini. That would be like going to Indiana, hoping to see the sunset over the Pacific. Santorini only gains points because everyone was in such a good mood. You’d be hard pressed to find someone who wasn’t having a good time. As Mary already mentioned, Santorini is expensive. You don’t go there expecting otherwise. However, for what you spend on hotels, food, and cab fare, I can think of a thousand other places or things you should be spending your money on. I appreciate being fortunate enough to have seen such beauty, but I wouldn’t be sad if I never went back to Santorini.